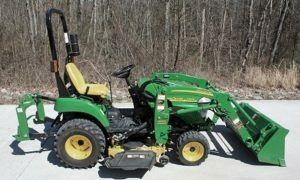 The John Deere 2305 is a compact tractor, that’s been manufactured in this form since 2006, without any changes. John Deere clearly knows that they have a winner on their hands. The 2305 looks a bit like a normal sized tractor that was shrunk, but kept the rest of the proportions the same. Those that need to use their tractors in tight spots, or don’t have too much room to store them in, should love this little tractor. You can keep it in a regular garage if you want to, though you should make sure it’s high enough, because the protection system against roll overs doesn’t fold down. The John Deere 2305 weighs just 1,450 lb and it’s powered by a liquid-cooled 3 cylinder Yanmar engine, with 24.1 HP onboard. The transmission is Hydrostatic – 2 range and you’re getting a Limited Cat. 1 3-Point hitch type, with a 681 lb lift capacity, at 24 inch behind the link arms. The Yanmar 3TNV76 diesel engine has an RPM of up to 3,000, and its 3 cylinders have an engine displacement of 1.1L (68 cubic inches). 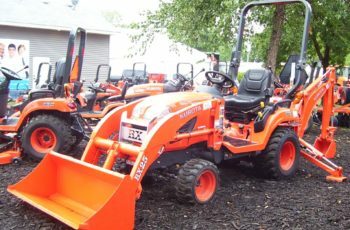 The fuel consumption of the 2305 is rated at 1.6 gallons per hour, at a 100% load. The fuel tank accommodates 5.5 gallons of diesel fuel, so it should be sufficient for a couple of hours of work. 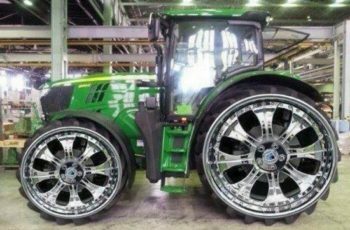 As for the rest of the John Deere 2305 specs, the wheelbase has 57.1 inches, the front tread range has 35.6 inches, the front axle clearance has 7.7 inches and the turning radius of this little tractor is 7.4 ft.
One shouldn’t worry too much about the performances you’re going to get from a tractor this small. Its size doesn’t impact the performances you’re going to get when you’re in a tight space and you should be able to get the work done. The 24.1 HP diesel engine can be fueled with No. 1 or 2 Diesel, or with B5 biodiesel. It will give you the same amount of power you’re going to get from models that are a bit larger than the 2305 model. Thanks to the isolators and the rubber mountings installed on its engine mounts, the noise and vibration you’re going to get while you’re using it are significantly less than what you’d expect. The torque offered by the engine is sufficient to give you the ability to pull or to push any kind of material. Moving loose gravel should be easy with the help of this small tractor, as tests have shown. Using it with the front-end loader attachment called John Deere 200CX proved that it can do the job well, with smooth feedback from its controls. You will notice that this is a comfortable tractor, with a seat that will keep you working for longer time periods, without fatigue. There is sufficient space near its seat as well, though you might be annoyed a bit about the control lever, which is not positioned very well, making you touch it with your leg all the time. Fortunately you have a lock which you can use to make sure the hydraulics are not accidentally engaged, but we would’ve preferred not to need to use it if possible.